A majority of the 3.3 billion people employed globally in 2018 experienced a lack of material well-being, economic security, equal opportunities or scope for human development, the International Labour Organisation (ILO) has found. 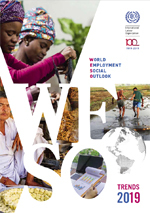 In its latest World Employment and Social Outlook report released last week, the ILO pointed out that being in employment does not always guarantee a decent living. "Many workers find themselves having to take up unattractive jobs that tend to be informal and are characterized by low pay and little or no access to social protection and rights at work." The 2030 Agenda for Sustainable Development has become a premier driver and justification for institutional and financial reforms along with the collection and analysis of more and more sophisticated data and statistics. Many UN Commissions are contributing to the implementation of the 2030 Agenda and achieving the Sustainable Development Goals (SDGs). One of these is the UN Statistical Commission, which meets for its 50th annual session 5 - 8 March 2019 at the UN headquarters in New York. Big data, geospatial data, national statistical capacity, and common standards for the exchange of data are among some of the agenda items the Commission will address, along with progress on the SDG indicator framework. In Palestine, the main obstacle to realizing the SDGs is the occupation that continues to confiscate lands and, as reported by UNCTAD, deny Palestinians the human right to development. The indicators are alarming: unemployment has reached 27.7 percent in the Palestinian territories occupied in 1967 and 44 percent in the Gaza Strip. The poverty rate for the year has reached 29 percent in 2017 and it is 53 percent in the Gaza Strip, reflecting the catastrophic effect of the 10-year ongoing blockade.